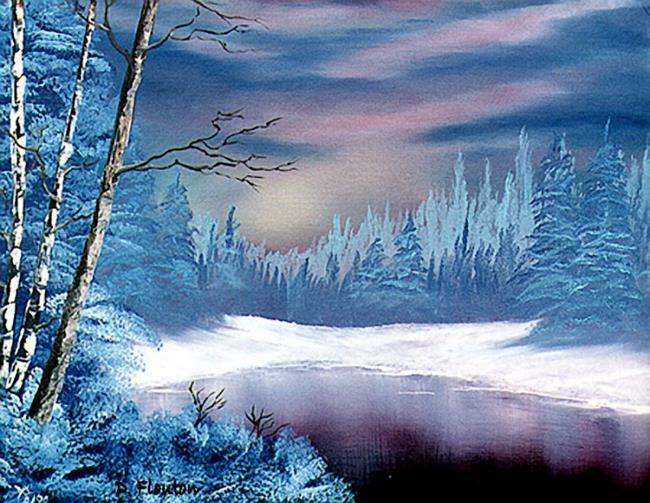 Winter scape painted while recovering from Lyme Disease. The pink to maroon tones in the painting are an unforgettable reminder of the pink/red bull's eye patches that my body had displayed during a particularly difficult bout with Lyme, a nasty infliction that has residual effects for years. In spite of what may have unconsciously influenced the painting, there is an overall calming effect, one of a cold, frosty winter evening just after sunset. I can imagine myself skating on the slick pond at the edge of a woodland just as a moon appears. Absolute tranquility...a peaceful haven.